Joseph Ziegler’s production of J.B. Priestley’s “When We Are Married” for the Shaw Festival is a study of comic timing , characterization, and line delivery. Everything is this letter perfect performance, from Kate Hennig’s slow burns to Mary Haney’s cheeky cook, zings with brilliance. Laughs abound because a masterful cast knows just where to place an emphasis or delay a reaction for maximum effect. To Ziegler and his company’s credit, the play’s thoughtful, thought-out performances also have a natural feel, so while you know you’re watching a stylized show primed to make the most of Priestley’s jokes and one-liners, you believe you are seeing actual people going about their lives, if in a dither. “When We Are Married” begins at a joint silver wedding anniversary party for three couples who were married on the same day in the same church and remained friends for the quarter century since that event. Happy, noisy chatter is heard from a dining room positioned stage left. In the living room, the delightfully informative maid, Ruby, and Haney’s grumpy cook have a word or two about the guests. Also, the host couple’s niece, Nancy, has a fleeting chat with her beau, a church organist and choir director to whom she intends to be married against her uncle’s wishes. The stage is set for fun, but Priestley adds to it by having the celebrating couples learn that the cleric who married them was not sanctioned to do so, and that, although each pair has lived together for 25 years, none has been legally wed.
As usual with comic dilemmas, the solution seems quick and obvious, especially when Peter Millard shows up playing a pastor from a nearby church who is empowered to rectify matters lickety-split. Priestley, after setting up that remedy, has his characters eschew it because they want to be married by a priest from the church in which all the men are now prominent stakeholders. Besides, such a neat resolution would preclude the premise for the play. The playwright is too adept at creating sustained mayhem to let that happen. The plot twists he comes up with give his audience far more entertainment . For one thing, each member of a couple has a chance to consider whether he or she wants to be married. As one says, 25 years of experience is a good way of telling if you want to continue as you are or strike off towards something — someone? — new. Priestley’s play is written to examine individual relationships and the personalities who turn into a couple. It has complications, like the disapproved of marriage, built in. It deftly uses maids, a news photographer, and woman on a mission, to make observational comments and keep matters varied. The elements are there for a rollicking good time, but it takes a cast like the Shaw’s to get everything spot-on right. Each actor has made his or her character an individual. Even if there are stock types, like the braggart or the termagant or the person who has no taste for the “la-dee-dah,” Ziegler’s skillful actors, go beyond the obvious or expected to show genuine people dealing with a puzzling situation. Some explore the possibilities of singlehood. Some say, “Bah!,” we’ve lived together for 25 years, we’re married nd that’s that.” One is reminded of a promise he made contingent on him not being married. With all of the ammunition Priestley supplies, I’ve seen “When We Are Married” fall flat and seem overbaked. Not at the Shaw! Each opportunity Priestley gives an actor is played to the fullest without a hint or hamminess or forcing a laugh. The Shaw ensemble is a cause for jubilation. It earns an enthusiastically laudatory response by making each utterance, each glare, each reaction, and each attitude the work of an artist. On the scale of comic presentations, this “When We Were Marrieds” rates a 10 for its consistent amusement, assured staging, and sterling portrayals. Odd though the predicaments that beset the characters are, everything on the Shaw stage happens so organically, you can’t wait to see how someone will handle a particular circumstance or hear what the characters will say next. Everything fits and proceeds so well, the production has no specific high point because it’s all one extended high point, pitched and weighted so the show’s energy never flags, and there is always something happening on stage to amuse. Wait! One caveat about “high points.” Towards the end of play, when the thorniest matters have been resolved, the six actors playing the married couples sing a song that is so beautiful in harmony and touching in sentiment, it rivets and delights at the same time. The song is a quiet, peaceful moment in show built upon calamity and uproar, and the change of pace it betokens is warm and refreshing. The Shaw’s sextet — Kate Hennig, Patrick Galligan, Claire Jullien, Thom Marriott, Catherine MacGregor, and Patrick McManus — is so wonderful, they lull you into a different type of contentment from that brought about by the more raucous sequences of the show. The sweetness of their harmony makes you forget the tumult marriage, or the thought one is suddenly not married, can be. Priestley defines his couples well, but Ziegler and company make each one more distinct. McManus’s Councilor Albert Parker is so conscious of his achievements, he gets testy if someone forgets to say ‘Councilor’ in front of his name. Parker is a man of action who doesn’t worry so much if an action is proper or prudent, so long as some move is taken. He is known for being a little tight with his wallet and for liking things to be plain and open. He takes the china shop bull’s role when the couples are told their weddings were for naught. Parker’s wife, Annie, is the quietest and most refined of the wives. She regards herself as a woman of stature in the town and in playing her, Catherine MacGregor shows a great deal of poise and pointed reserve. Annie is also the most independent and worldly of the wives. Patrick Galligan’s Herbert Soppitt gives in to everyone. He is roundly henpecked by his wife, Clara, and he demurs to Parker and their anniversary mate, Alderman Joseph Helliwell, in any instance of disagreement. Kate Hennig, as Clara Soppitt, is stout, staunch, and not likely to brook any nonsense. She is the most practical of the six celebrants, respectably middle class down to the nail on her pinky, and while she is pleasant in general company, you can tell she rules Herbert with an iron fist at home. One look from Hennig could intimidate anyone who tried to refute Clara or tangle with her in any way. Hennig, having a wonderful season, in “When We Are Married” and a Tennessee Williams one-act, “A Lovely Sunday for Creve Coeur,” uses her physicality and stern face to great advantage. Clara can cut loose and be funny or charming on occasion, but most of the time, she is bossing Herbert or standing the ground for calm and normality regarding the marriage dilemma. This is not an easy person to please and a formidable woman to cross. Helliwell, as the host of the anniversary party, is convivial. He is just as strong and opinionated as Parker, and though he likes credit where it’s do, he doesn’t seek to dominate as much as Parker does. Helliwell’s life seems the most balanced. Although he can bark loudly and be moralistic when it comes to judging suspected night-time ramblings of the church organist his niece intends to marry, he, as portrayed by Thom Marriott, is more consistent and less quirky than the other “unmarried” men. His inclination is to lead a discussion that will resolve his and his friends’ dilemma. His wife, Maria, played by Claire Jullien, seems the most contented of the wives and the one most at ease with the peremptory tottering of her marital status. All of the actors endow their characters with distinctive traits. McManus sneers and does a little shift of his hips every time he impugns something as being “la-dee-dah.” Hennig tends to stand erect, looking like a strict and agitated teacher about to discipline her unruly class. Galligan cowers by looking down and acting sheepish when given orders by Hennig. His Soppitt gets some of his own back by behaving contrary to Clara’s directions, and even defying her with a “shut up” when he no longer has to recognize her as his wife. The pride Galligan conveys at that defiance reveals a man restored of confidence and ready to make stands if and when matters return to normal. MacGregor’s Annie Parker seems the coolest, most self-contained, and most genteel of the wives, but she shows what is going on in her head when she gets a chance to speak to Parker about problems in their marriage that may make it justifiable for her to proceed through life on her own without him. Attitudes and postures play a big part in Ziegler’s production, but large or subtly expressed, they always seem right for the occasion and become the straw from which the Shaw cast spins comic gold. The six nuclear actors are not alone in giving nuanced portrayals and garnering positive attention. Jennifer Dzialoszynski is brightly funny as a young housemaid who is all too eager to observe things about her employers, the Helliwells, and to gossip animatedly about all she sees and hears. Dzialoszynski becomes absolutely exuberant when she has a juicy tidbit to share. Her unbounded enthusiasm for newsiness has her telling stories to anyone who will listen. Mary Haney, the moving Juno of the Shaw’s “Juno and the Paycock,” gives a bristlingly sly performance as a cook who finds out the anniversary couples’ secret before it is revealed, mainly by listening at a doorway, and saucily resigns, saying she can’t work in a house where immoral doings are taking place. Haney’s Mrs. Northrup is actually using her employers’ predicament to keep them from complaining about her poor service and some breakages. The actress is wonderful as she wheedles out of her own situation by casting unfavorable light on the Helliwells’. Her snappy delivery and outright temerity are fun, and funny, to behold. One can only enjoy Mrs. Northrup’s belligerence as she dons her hat and coat and announces she is leaving early to have some pints with her husband at a local pub. Wade Bogert-O’Brien has the right tone as a newspaper reporter attempting to write a story on the three couples’ mutual milestone. Peter Krantz is hilarious as an increasingly intoxicated photographer assigned to duplicate the wedding picture the couples took 25 years previously. Krantz’s confusion and pratfalls add comic relief to a show that is always riotously rife with comedy. Fiona Byrne is deliciously brazen as a townswoman who hears about the unsanctioned unions and comes to the Helliwell home to claim one of the husbands, one who told her he would marry her if he was ever shed of his wife, while the claiming is possible. As the romantic young couple seeking the Helliwells’ unlikely blessing on their engagement, Charlie Gallant is smartly roguish, and Kate Besworth is sensible and hopeful. You want this pair who have their request to marry granted. From Krantz’s looks that make you wonder if he has any idea where he is or what he is supposed to doing to Hennig’s witheringly stern gazes as Galligan’s weakling of a husband, you know the Shaw cast is command of every moment of Priestley’s play and Ziegler’s production Individually and as an ensemble, the “When We Are Married” earns the audience’s deep admiration. You could not ask for a better production of this play. The excellence extends to Ken McDonald’s marvelous set that shows period taste while providing many handy playing areas. Sue LePage’s costumes were equally spot-on. “When We Are Married” runs through Sunday, October 26 at the Royal George Theatre at the Shaw Festival, 85 Queen Street, in Niagara-on-the-Lake, Ontario. 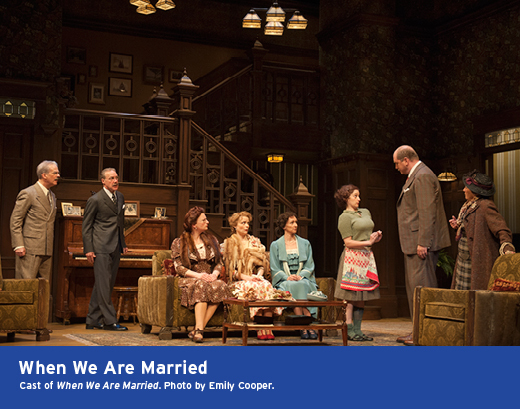 Showtimes are staggered because “When We Are Married” is performed in repertory. Two additional performances of the show have recently been added to the Shaw calendar. Tickets range from $113 to $35 CDN and can be obtained by calling 1-800-511-SHAW (1-800-511-7429) or by visiting www.shawfest.com. This entry was posted on September 2, 2014 by nzoren in Theater Reviews and tagged Canada, Catherine MacGregor, Charlie Gallant, Claire Jullien, Comedy, Fiona Byrne, J.B. Priestley, Jennifer Dzialszynski, Joseph Ziegler, Kate Besworth, Kate Hennig, Mary Haney, Niagara-on-the-Lake, Patrick Galligan, Patrick McManus, Peter Krantz, Royal George Theatre, Shaw Festival, Thom Marriott, Wade Bogert-O'Brien, When We Are Married.